Here’s a video of a fish mimicking a mimic octopus that mimics fish. Let me explain. 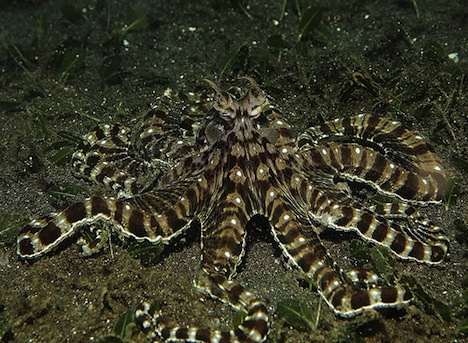 First described by scientists just back in 1998, the mimic octopus was discovered to routinely mimic other creatures as a protection mechanism. Many of the species the mimic octopus copies are venomous, or not preyed upon by its common predators. The mimic octopus is known to mimic the likes of sea snakes, lionfish, giant crabs, shells, jellyfish, stingrays, and other species. It’s clever enough to adapt to different situations and go quickly into disguise accordingly. If it encounters and aggressive fish, it might take the form of a poisonous sea snake, for instance. In turn, the small jawfish, seen in the video, is able to closely follow the mimic octopus around. The appearance of the jawfish is very similar to the mimic octopus (although the octopus can change color), so it’s able to disguise itself amongst the legs of the octopus. The fish is pretty difficult to spot at first, as it even mimics the octopus’ movements to a certain extent. Apparently this relationship between the octopus and the jawfish had never been recorded before this video, which was shot by Godehard Kopp from the University of Göttingen in Germany. He sent it to biologists at the California Academy of Sciences (CAS) to help identify the fish. It’s worth pointing out that the reefs where these sea creatures live in the Coral Triangle are in rapid decline, according to CAS, and this is predominantly due to human activity. It would certainly be a great shame to lose amazing sea life like this. Here’s another video with more on the incredible life of the mimic octopus. They’re very clever!